Definitely, we will celebrate Christmas this year because the world did not end on December 21,2012 as predicted by the Mayan Calendar. The phenomenon that captured global attention and triggered the wildest speculation was for me simply a metaphor for the passing of the old world at war with itself and the birth of a kinder and safer planet that we can build together. It did end however for my Mom, Lillian Palermo Meloto, whom we laid to rest last December 19 in her beloved City of Bacolod. She was buried without much tears, just a lot of nostalgia, recollection of fond memories, joyful reconnection with clan and kin and a deep sense of gratitude to God for the full life she lived and the impact she had on people in 99 years of earthly existence as a faithful wife, devoted mother and dedicated public school teacher. She taught me early the meaning and value of unconditional love, uncompromising integrity and faith in action which served as the anchor and compass of my GK journey later in life. She lived simply, died peacefully and left a legacy of values that shaped my future — just an ordinary housewife like many in GK who are building a New World that will care more and share more, will have less selfishness and greed, less extravagance and debts, less societal dysfunctions and senseless deaths. This year also put a close to the earthly life of Peter Tiu of GK Iloilo who set the bar for every day heroism, invading rebel territories and crime-infested slums armed only with the power of purpose and the courage to care. When heroes fall from the sky, more will learn how to fly — the same message I gave when I said goodbye to good friend and patriot Jesse Robredo. Like our daring volunteers in last year's typhoon Sendong that devastated Iligan City and Cagayan De Oro and this December's super howler Pablo that hit a wide area in Eastern Mindanao who learned to walk on water to save others. They are setting a pattern as often the first to arrive in disaster areas for rescue, a dedicated ground team for relief operations and the last to leave to do rehab and relocation work in keeping with the GK spirit of "walang iwanan" (leave no one behind). Our heroes go to dangerous areas to make them safer, will not abandon the needy who are considered as family. Because of this Gawad Kalinga has become the top-of-mind choice of big donors like San Miguel, Berjaya, Shell, SM and BDO and also the most popular brand in the country for volunteerism. 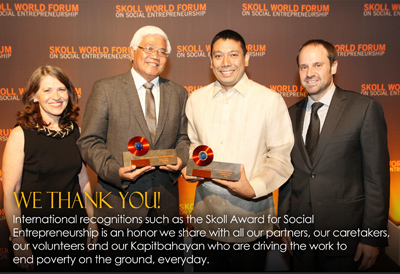 The global awards this year, notably Skoll and the World Entrepreneurship Forum, attest to the effectiveness of every day heroism in the Philippines on a scale that can inspire other nations as a template for ground-up inclusive development. In all of this I must commend our Executive Director Luis Oquiñena for his efficient yet compassionate leadership. We could only hold back our tears as he gave regular updates on the roller coaster ride of our volunteers, including many KBs (GK villagers), through the Compostela valley of death. >> Read more in "A GK Volunteer's Journal: Reaching Out to the Typhoon Pablo Victims"
We shared his grief as he narrated the harrowing story of a father wiping the mud from the dead body of his 7 year old son outside our GK site in New Bataan, Compostela Valley, but we also rejoiced with him when he reported that there was no casualty among the 400 residents in our GK village in the town despite the widespread devastation all around because it was located on high ground as required by our geo-hazard standard. 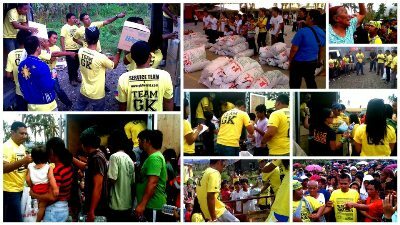 In many sites the GK villages became the centers for relief operations, while former calamity victims who became GK beneficiaries paid forward as volunteers. As we view the landscape this year, GK is gaining greater public recall as a brand of hope starting with former squatters in urban slums, now to calamity victims in vulnerable areas and soon to farmers as we expand our economic platform for countryside development. The first (of 25 sites nationwide) GK Enchanted Farm Village University in Angat, Bulacan is attracting convergence for BOP wealth creation and rural job generation. The Shell Centre for Social Business Start-ups, Hyundai Centre for Green Innovation, Human Nature's Health and Beauty Centre, Lifebank's Bayanihan Economics Centre, ODM's Design Centre, Mitsui's Agricool Centre and Berjaya's Culinary Centre will hopefully be ready by June next year to cater to two hundred thousand visitors annually. With the entry of DAR, DENR, DA and LGUs, the stage is nearly ready for an effective public/private partnership that aims to raise five hundred thousand social entrepreneurs to help improve the lives of five million rural farmers and urban blue collar workers by 2024. 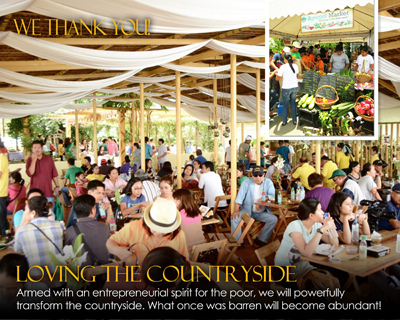 >> Read more about the GK Enchanted Farm in "A Convergence of Love"
This is coming at a time when the Philippines is gaining the trust of the global community due to the honest and competent leadership of President Noy Aquino and his cabinet, making our economy the fastest growing in Southeast Asia with the most stable stock market and currency. There is a surge of patriotism that is so palpable, encouraging more young Filipinos not to leave the country, engage more in social innovation, create more opportunities at home rather than seek for it abroad, turn unproductive fertile lands into fields of abundance and secure our food source and supply chain for industrialization, produce and patronize excellent local products and trigger a period of Social Artistry for sustainable prosperity and peace. The GK Enchanted Farm is capturing the global mood for greater solidarity and more effective stewardship of people and planet and attracting a growing stream of foreign interns, starting with the French invasion, to discover the treasures of Asia in our GK communities and help create wealth with justice. Simple lessons learned this year. Heroes are born with every tragedy. Sacrifice is the heart of love. Through miracles of solidarity, a new world will rise where no one is homeless or hungry, neither an enemy, a victim or a prey. Our Saviour came into this world as a squatter with a simple carpenter for a father to show us that the masterplan for global prosperity and peace is to build sustainable communities where resources are shared and no one is in need (Acts 4:31-35), scant resources are leveraged following the miracle of the 5 loaves and 2 fish (Matthew 14:13-21) and sustainability is achieved following Jesus direction to bear fruit that will last (John 15:16). Christmas will never be stolen from those who love and those who hope. Thank you to all those who share this faith journey with Gawad Kalinga where hope abounds and the love of Christ is always around.